Using Mastic Asphalt for roofs is one of the oldest traditions to date which is still used. 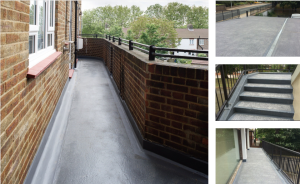 Asphalt allows the roof to be finished in a smooth finish whilst still allowing the roof to be water tight. It can also be used for balconies, terraces, flooring and tanking as it is such a flexible material. If you have an Asphalt roof which needs replacing Stay Dry Roofing can either replace your roof with Asphalt or re-fit your roof with felt. Both of these methods come with up to a 15 year guarantee.